The Mundi My Big Fat Wallet is stuffed full with essentials to keep the modern women organized. A spacious interior features 8 credit card slots, 5 clear ID windows, a checkbook slot and a calculator. An exterior zippered pocket reveals 2 additional pockets for storage and a zippered coin pouch. In addition to money, this wallet is perfect for storing your cell phone, photos, receipts, business cards, etc. 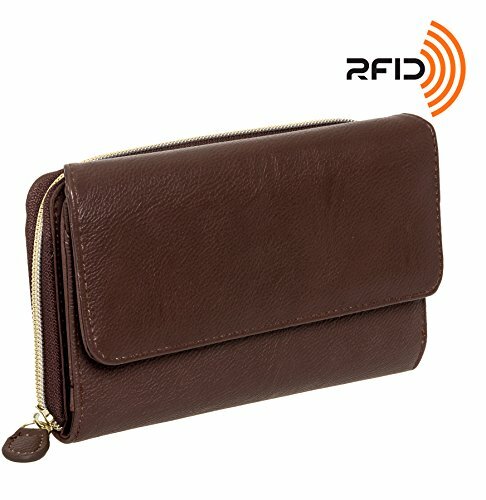 A RFID privacy liner shields your credit cards and IDs from criminal technology that has the ability to steal your personal and very valuable information. Rest easy knowing that you're the most organized you can be, while also taking an extra precaution to protect yourself. Measures 7.5" x 4.5" x 1.5"